A slash-resistant body (don't even try, pickpockets) and RFID-blocking pocket to protect personal info. With this crossbody, you've got the whole security thing in the bag. 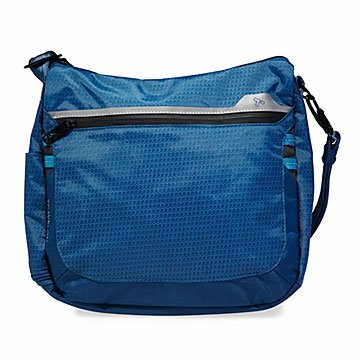 Ideal for active adventurers, it"s equipped with a slash-resistant body (don't even try it, pickpockets), a roomy main compartment with a RFID-blocking pocket for protecting your personal information, plus other handy features, like a tethered key clip/LED light and a mesh water bottle holder on the side. Yep, you just found your new favorite travel companion. Made in China. This purse has it all. Protection with the material used, to pockets for all shapes and sizes for doodads. After a day of power shopping I Appreciated this purse even more for how well it is built . The zippers are smooth (every time), the strap has a swivel clip so it will not twist on your shoulder. It was designed with a top zipper, not a flap that you have to flip up before you unzip to open. I love this purse, it shows there was thought put in to the design.